PLOG - The PNLIT Blog: Lake Revival a Myth? "Lake Revival a Myth?" is an article in today's New Indian Express reproduced below. 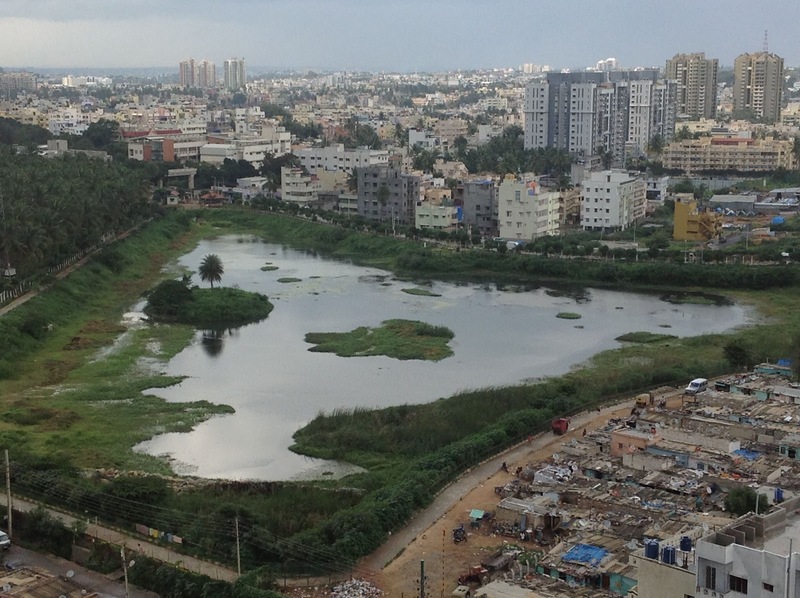 PNLIT is happy and proud to say that Puttenahalli Lake revival is not a myth. The newspaper report has cited our work in the last para (highlighted in bold). If you would like know what exactly we have done to revive the lake and how we are maintaining it as a People's Lake, please join a special Tour of Puttenahalli Lake on Sunday, 22nd Sept. at 9 a.m. Walk duration 1 hour 15 min. Please email <puttenahalli.lake@gmail.com> to confirm your participation. The city has survived on lakes for centuries which were interconnected by an intricate network of canals. These lakes captured rainwater and stored it for use in post-monsoon, thereby, recharging ground water levels. Today, however, barring some of the bigger lakes, none has received water this monsoon, and so have remained dry. 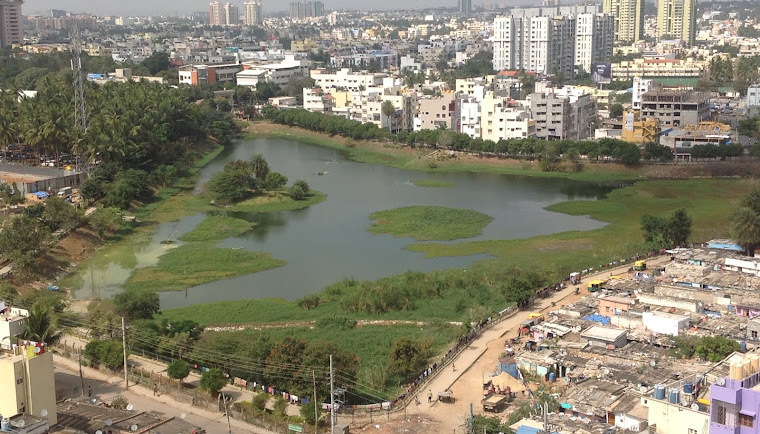 "This was to be expected as measures need to be taken to save the water bodies of this city. Now it seems too late to restore our lakes to their former glory," says Leo Saldanha, Environment Support Group. 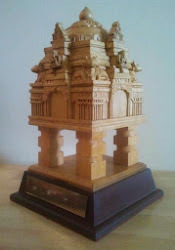 "First, the raja kaluves need to be stripped off their concrete heads so that porosity of soil beds is increased. People think that most of the water is stored in the lakes, but it's actually in the canals. Trees and shrubs need to be planted along these canals, so as to help the water seep into the soil. Secondly, strict action needs to be taken against those who let out untreated waste into these waters. Residential sewage pits also need to be built. All lakes should also have their own lake protection committees," adds Leo. Maintenance of the lakes has also been suspect with their care distributed among multiple authorities. However, the BBMP feels that this year has seen some progress when it comes to lake rejuvenation through rain water replenishment. "Most of the lakes that have been developed recently, are all receiving water. The feeder canals have been opened and you can see fresh water flowing into the lakes," claims Satish, chief engineer, BBMP. The Karnataka Government had passed a special law making rainwater harvesting mandatory for certain class of dwellings and commercial establishments in 2005. However, Leo says, from the 15-20 lakh buildings that are supposed to implement this system, only 50,000 have actually done so and of these, many systems don't function. Usha Rajagopalan, trustee, Puttenahalli Lake Trust, says, "On May 22, we had two buckets worth of water in the lake. Post the rains, the same evening, 45 per cent of the lake bed was covered. Over the entire monsoon, we saw an 80-85 per cent rise in coverage." She adds,w both residents and the government need to work hand -in-hand if lakes have to be recharged.